Opioid use may drive the numbers. Drunk driving felony cases also rose. Drug possession, bail jumping and traffic crime cases were the major drivers pushing Wisconsin’s felony caseload up 8 percent last year, statistics show. 7,966 felony drug possession cases, up 982, or 14% from the 6,984 cases filed in 2016. 7,903 felony bail jumping cases, up 869, or 12%, from the 7,034 cases filed a year earlier. 3,503 felony traffic cases, up 854 cases, or 32%, from the 2,649 cases filed in 2016. The number of all felony cases opened in the state rose from 39,171 in 2016 to 42,197, an increase of 3,026. 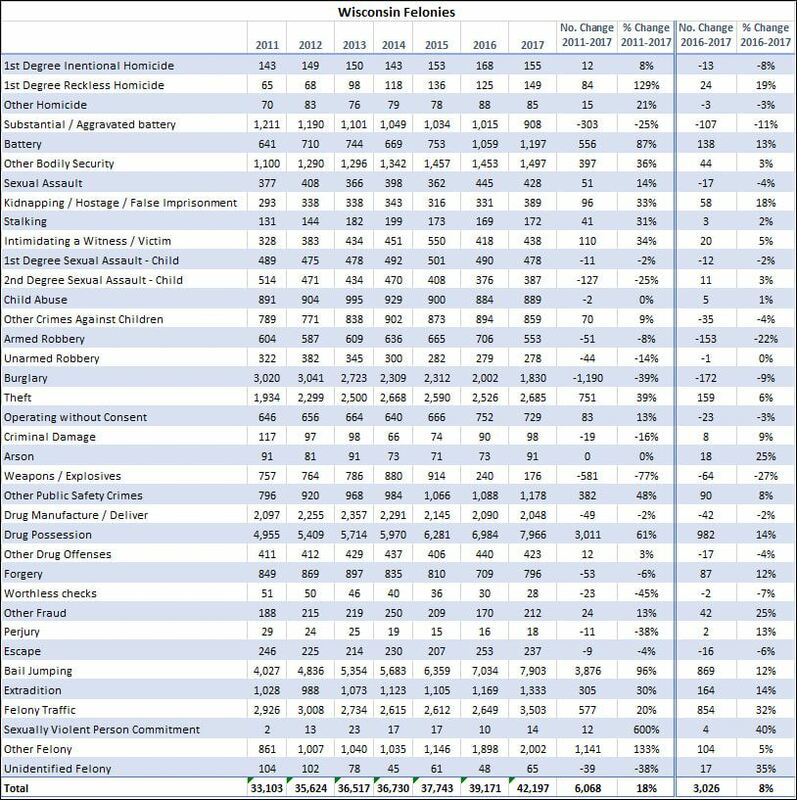 The numbers, provided by the Wisconsin Courts System do not reflect every charge filed, but the cases opened in which a drug possession charge was the most serious, or first listed. 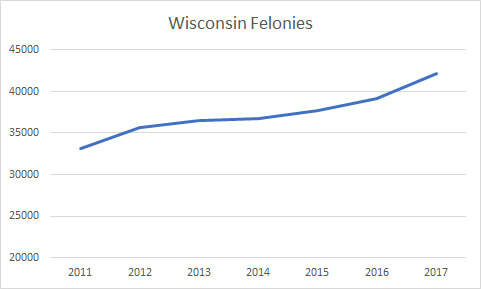 Drug possession was the most common felony case opened in Wisconsin, accounting for about 19% of felonies filed in the state last year. The 14% increase doubtless reflects the increased presence of opioids and methamphetamine in the state. Felony bail-jumping charges are criticized by defense lawyers for the negotiating advantage they give to prosecutors. There have been double-digit increases in felony bail jumping cases every year except one during the past six years – their numbers rose 20 percent in 2012, 11 percent in 2013, 6 percent in 2014, 12 percent in 2015, and 11 percent in 2016. They accounted for just under 19% of felony case openings statewide. Felony bail jumping ranks second in the type of case opened. Felony bail jumping occurs when person out on bond in a felony case violates the condition of the bond, even if the violation is itsef not a crime. Having a beer in defiance of an “absolute sobriety” order, for example, could subject a person to a felony bail jumping charge, as could missing a drug test or a court date. Felony bail jumping is punishable by up to six years in prison, which may well be a longer sentence than the offender faces for the original crime. The big jump in felony traffic cases last year was driven, no doubt, by tougher drunk driving laws that made fourth offense drunk driving a felony rather than a misdemeanor. There were 2,469 felony drunk driving cases opened statewide in 2017, up 40%, or 701 cases, from the 1,768 felony drunk driving cases filed in 2016, according to statistics. 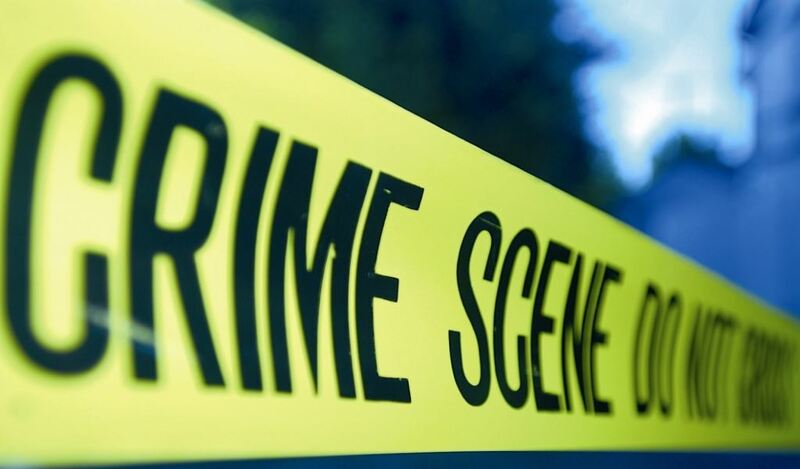 The biggest declines were in burglary and armed robbery cases, according to the statistics. Burglary cases dropped from 2,002 cases in 2016 to 1,830 cases last year, down 172 cases, or 9 percent. Armed robbery cases 706 in 2016 to 553 last year, down 153, or 22%. Outstanding news. Let’s get the hard-core drunks OFF the road, get the crime and violence-spreading drug dealers and users LOCKED UP, and make our communities safe and secure. The fewer innocent families are victimized by repeat offenders and career criminals, the stronger our communities become!